14mm, f/11, 1/100s, ISO 100. The ultra-wide zoom lens market just became more competitive. Sigma's new 14-24mm f/2.8 lens is not only poised to deliver excellent image quality, it's also designed to do so at a low price while remaining aimed squarely at enthusiasts and professionals. It undercuts Nikon's highly-acclaimed 14-24mm f/2.8 by nearly $600 and Canon's similar -- although not a matched substitute -- 11-24mm f/4 by $1,400. Ultimately, the question with a lens like the Sigma 14-24mm f/2.8 is not just how good is it, but is it similar or better than the Canon and Nikon competition? In the following Field Test, we will certainly be looking at how good the lens is, but we will also be able to compare it directly against the Nikon 14-24mm f/2.8, which continues to be a benchmark lens in this category. The Sigma 14-24mm f/2.8 DG HSM Art lens has the standard Sigma Art lens look and build quality. This means that the lens looks stylish and feels great in the hands. In the case of the 14-24mm f/2.8, it feels heavy. It weighs just over 2.54 lbs (1.15 kg). It is also rather large, at least in terms of diameter. The 14-24mm is just over 5 inches long (135 millimeters) with a maximum diameter of 3.8 inches (96 millimeters). If you're familiar with the Canon 11-24mm f/4 or Nikon 14-24mm f/2.8, the Sigma 14-24mm is almost the same size and weight as the Nikon lens and lighter and with a bit less diameter than the Canon zoom, although it's roughly the same length. Much like the Nikon, the Sigma has a built-in petal-shaped lens hood -- which can actually be removed by Sigma if you don't mind letting in light and leaving the front element exposed -- and the zoom ring is closer to the camera body than the focus ring. Both of the rings on the Sigma have ridged rubber surfaces that offer good grip. They rotate with a heavy feel but with nice smoothness. The zoom ring requires less than a quarter turn to go from 14mm to 24mm, which is nice, and the 14, 16, 18, 20, 22 and 24mm focal lengths are marked with painted numbers. The zoom ring is about three-quarters of an inch wide (just under 20 millimeters) and the focus ring is a bit wider, around an inch (25 millimeters). Between the focus ring and the zoom ring is a focus scale. Thanks to the heavy feeling of the focus ring, it's very easy to make precise focus adjustments. The lens is weather-sealed and has a brass bayonet mount. The lens certainly feels rugged in the hands and should stand up to challenging shooting conditions. Further, the front lens element -- which inevitably will get touched at some point thanks to its very bulbous nature -- has a special coating to allow easy removal of water and oil. It isn't just on the camera that the lens feels protected, but when you aren't using it as well; it includes a very nice rectangular soft case, which is robust. Further, the lens cap slips on easily while doing a good job staying in place on the lens. It has a soft-lined interior to ensure you don't damage the barrel of the lens when taking the cap on and off too. Overall, the Sigma 14-24mm f/2.8 Art lens looks good, feels great and has been very intelligently designed. While I don't have the Nikon version on hand, Sigma states that each version follows the same rotation pattern as its original mount -- so in the case of the Canon, you zoom in by rotating in a counter-clockwise direction. It's thoughtful design elements like this that make the Sigma's very reasonable price point look all the more attractive. It's a high-end lens that doesn't break the bank. The Sigma 14-24mm f/2.8 has 17 elements across 11 groups. Of those 17 elements, there are three each of FLD, SLD and aspherical elements. The lens also includes Super Multi-Layer Coating to reduce lens flare and ghosting. What do all these elements translate to in terms of image quality? When we consider central sharpness in particular, the Sigma 14-24mm f/2.8 lens is pretty impressive throughout the focal length range. You can see a full set of test shots from 14mm, 19mm and 24mm in the Gallery, but I have included some specific crops and test shots below. 14mm, f/11, 1/30s, ISO 100. 100% crop of the bottom left corner from a straight-from-the-camera JPEG file. Click for full-size image. Click here for the RAW file. 100% crop from the bottom edge from a straight-from-the-camera JPEG file. Click for full-size image. Click here for the RAW file. Looking specifically at the widest focal length, 14mm, we see good central sharpness even when shooting wide open. However, as you move toward the edge of the frame, performance drops off significantly. Some of the blur I saw is due to depth of field, even at 14mm, but some of it is certainly just the lens being pushed past its limits. It isn't dissimilar from what I have seen with my own Nikon 14-24mm f/2.8 at 14mm, however. If you stop the lens down a bit, even just to f/5.6 or f/8, the edge performance improves dramatically. If you are shooting landscapes at 14mm, you ought to stop the lens down. 14mm, f/2.8, 1/500s, ISO 100. Full 14mm test shot. Click for full-size image. Click here for the RAW file. 100% center crop from a processed RAW file with Adobe Camera Raw default settings and lens corrections enabled. Click for full-size image. Click here for the RAW file. 14mm, f/8, 1/50s, ISO 100. 100% right edge crop from a processed RAW file with Adobe Camera Raw default settings and lens corrections enabled. Click for full-size image. Click here for the RAW file. At 19mm, the story is much the same. I expected improved edge performance given the "middle" focal length -- an area where zoom lenses typically excel -- but stopping down here is important, too, if you want to have good performance across the frame. With that said, when you do stop down, the lens delivers very good sharpness and detail at 19mm. 19mm, f/2.8, 1/400s, ISO 100. Full 19mm test shot. Click for full-size image. Click here for the RAW file. 19mm, f/8, 1/50s, ISO 100. Turning our attention to the longest focal length, 24mm, central and corner sharpness is similar to 14mm when shooting wide open. There is still quite a bit of sharpness falloff as you move away from the center and stopping down is critical for ensuring good performance across the frame. With that said, I think that the lens performs better across the frame at 14mm than it does at 24mm, although I am splitting hairs. This is fine by me as most people will be using a 14-24mm zoom lens somewhere short of 24mm. After all, you don't typically buy an ultra-wide lens to zoom in. 24mm, f/2.8, 1/320s, ISO 100. Full 24mm test shot. Click for full-size image. Click here for the RAW file. 24mm, f/8, 1/40s, ISO 100. Overall, the Sigma 14-24mm f/2.8 lens is very sharp in the center across the focal length range. Stopping the lens down to f/5.6 and f/8 ensures very good central sharpness and good performance throughout most of the frame, although the extreme edges are still problematic, particularly at 14mm and 24mm. Diffraction rears its ugly head at f/16 throughout the focal length range, so I would recommend avoiding apertures beyond f/11 if you want to draw the best performance from Sigma's new ultra-wide zoom lens. And there's a lot of great performance available. When shooting with the 14-24mm lens at its focal length extremes and a wide-open aperture, there is moderate vignetting. In the test shots below, I reduced clarity to lessen the impact of detail in the frame, but otherwise simply converted the RAW files in Adobe Camera Raw with default settings. You can see that stopping down to f/4 at 14mm makes a big difference with vignette, although there are still issues in the corners. 14mm, f/2.8, 1/1000s, ISO 100. Vignette test image. Processed RAW file with Adobe Camera Raw defaults. Click for full-size image. Click here for the RAW file. 14mm, f/4, 1/500s, ISO 100. At 24mm, the story is much the same. There's noticeable falloff in the corners with some rather significant darkening at f/2.8 which is reduced by stopping down. I think that the vignette is worse at 14mm than it is at 24mm, which is not very surprising. In any case, much like it is with sharpness, you will want to stop the lens down to f/5.6-11 to ensure the best optical performance, including dramatically reduced vignette. 24mm, f/2.8, 1/1000s, ISO 100. 24mm, f/4, 1/500s, ISO 100. The Sigma 14-24mm f/2.8 delivers good control of aberrations and other optical issues, in most cases. It also mostly avoids issues with lens flare thanks to the built-in lens hood, although on rare occasions, particularly at wider focal lengths when the front element is further forward, the lens can experience some flare, which is the case with other ultra-wide lenses I've used. 14mm, f/8, 1/125s, ISO 100. The Sigma 14-24mm f/2.8 typically handles flare well. You can see only a small bit of lens flare here despite the sun being pointed right at the left side of the lens. The petal-shaped lens hood does a good job of keeping light off the front element. 24mm, f/18, 1/25s, ISO 100. Even shooting into direct sunlight didn't result in many issues. There's a bit of flare beneath the sunburst, but it's very manageable, and the lens produced an image with good contrast and colors. While the lens does a good job of minimizing chromatic aberrations and purple fringing -- neither of which were an issue for me during my time with the 14-24mm -- the lens does suffer from some comatic aberration. This relatively obscure aberration is very rarely an issue during most types of photography as it only affects small points of light. However, this is precisely what you photograph when doing night sky photography. I regularly use my Nikon 14-24mm f/2.8 for night photography, and it has some issues with corner performance and comatic aberration, so I was curious to see how the Sigma performed. Conditions were very rarely good for night shooting during my brief time with the lens, but I did grab a few test shots to check for coma, and it's certainly there at 14mm. As you can see in the 100% crop below, which was taken from the edge of the frame, the star is not a circular point but is rather more like a blob. The coma isn't bad nor is it unusual, but it is still something worth keeping in mind if you plan to use the 14-24mm f/2.8 for night photography. You may need to crop a bit of the final image if making large prints, otherwise the stars won't have the desired pinpoint appearance. Overall, despite weather conditions limiting my time for night photography during my review period, I'd say that comatic aberration from the Sigma was very similar to what I've seen from my Nikon 14-24mm lens. 22mm, f/2.8, 6s, ISO 800. In this 100% crop from the above image, we can see that there is some comatic aberration near the edge of the image. It's not terrible and can be dealt with by stopping down or cropping, although neither of those are perfect solutions. It's worth keeping in mind if you intend to do night shooting with the Sigma 14-24mm f/2.8 Art lens. 14mm, f/2.8, 8s, ISO 800. The Sigma 14-24mm f/2.8 is not a macro lens, of course, but close focus performance still matters to many photographers, especially those who like to utilize foreground elements in landscape images. The minimum focus distance for the lens is an impressive 10.2 inches (26 centimeters), which allows for a maximum reproduction ratio of 1:5.4. This is adequate for nearly all foreground situations. 14mm, f/2.8, 1/320s, ISO 100. Close focus distance test image at 14mm. Click for full-size image. Click here for the RAW file. 24mm, f/2.8, 1/200s, ISO 100. Close focus distance test image at 24mm. Click for full-size image. Click here for the RAW file. Autofocus performance is notably quick and decisive. The 14-24mm lenses uses a Hyper Sonic Motor (HSM) and offers an optimized AF algorithm that Sigma states provides smoother autofocus performance. The lens focuses smoothly, to be sure, but I was impressed by how quiet the autofocus is. There is also full-time manual focus override, which is nice. 14mm, f/8, 1/15s, ISO 100. 14mm image. Click for full-size image. Click here for the RAW file. 24mm, f/8, 1/15s, ISO 100. 24mm image. Click for full-size image. Click here for the RAW file. 14mm, f/2.8, 1/2000s, ISO 100. Testing the 14-24mm f/2.8's depth of field at 14mm and f/2.8. Compare to the depth of field available when you zoom in to 24mm by checking out the image below. Click for full-size image. Click here for the RAW file. 24mm, f/2.8, 1/2000s, ISO 100. Testing the 14-24mm f/2.8's depth of field at 24mm and f/2.8. Compare to the depth of field available when you zoom out to 14mm by checking out the image above. Click for full-size image. Click here for the RAW file. 23mm, f/8, 1/320s, ISO 100. 14mm, f/5.6, 1/8s, ISO 100. 24mm, f/16, 0.8s, ISO 100. 24mm, f/8, 1/6s, ISO 100. 17mm, f/20, 1/5s, ISO 100. With their new 14-24mm f/2.8 DG HSM Art lens, Sigma has continued their tradition of releasing excellent lenses with great build quality at a fair price. The Sigma 14-24mm f/2.8 costs less than Nikon's 14-24mm f/2.8 and is an appealing alternative to Canon's even-pricier 11-24mm f/4 lens. While not quite as wide as the latter, the Sigma 14-24mm is plenty versatile for an ultra-wide angle lens, and it delivers good-to-great optical performance across the board. It is built to professional standards, delivers high-end results and is less expensive than the competition. There's very little not to like here, and Sigma has delivered yet another great lens. 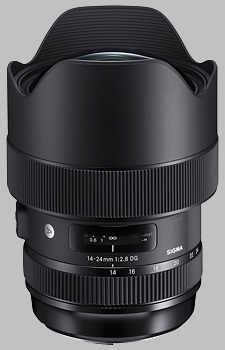 (From Sigma lens literature) SIGMA is introducing the 14-24mm F2.8 DG HSM | Art as the ultimate ultra-wide-angle zoom. While minimizing distortion, this lens offers outstanding F2.8 brightness throughout the zoom range and delivers top-level image quality at every focal length and every shooting distance. For these reasons, it is the definitive wide-aperture ultra-wide-angle zoom lens. Like SIGMA's Sports line lenses, the 14-24mm F2.8 DG HSM |Art features a highly effective dust- and splash-proof structure with special sealing at the mount connection, manual focus ring, zoom ring, and cover connection, allowing photographers to work in all types of weather. In addition, the front of the lens is protected by a water- and oil-repellent coating that makes cleaning easy. The high-speed, high-accuracy autofocus helps photographers react in an instant to get those special shots. Today's virtual reality creators favor multi-camera videography that leverages the capability of ultra-wide-angle lenses. Addressing this trend, SIGMA is offering the new Front Conversion Service, in which SIGMA converts the petal-type hood of the 14-24mm F2.8 DG HSM | Art lens to an exclusive round component. This altered front structure allows the lens to be deployed with greater freedom in multi-camera VR videography. The new front also helps prevent the lens from interfering with other lenses or from casting a visible shadow. The use of this service has no impact on the validity of the product warranty. The ultra-wide angle Sigma 14-24mm F2.8 DG HSM Art lens will begin shipping in mid-March 2018 for a retail price of $1,299.00 USD. The Sigma 14-24mm f/2.8 DG HSM Art doesn't have any user reviews yet!